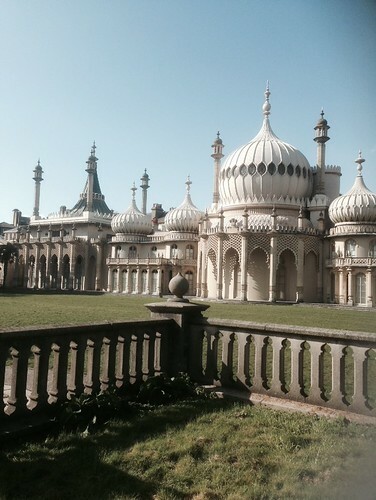 The Royal Pavilion is a former royal residence located in Brighton, England, United Kingdom. It was built in three stages, beginning in 1787, as a seaside retreat for George, Prince of Wales, who became the Prince Regent in 1811. It is often referred to as the Brighton Pavilion. It is built in the Indo-Saracenic style prevalent in India for most of the 19th century. he Prince of Wales, who later became George IV, first visited Brighton in 1783, at the age of 21. The seaside town had become fashionable through the residence of George’s uncle, Prince Henry, Duke of Cumberland, whose tastes for cuisine, gaming, the theatre and fast living the young prince shared, and with whom he lodged in Brighton at Grove House. In addition, his physician advised him that the seawater would be beneficial for his gout. In 1786, under a financial cloud that had been examined in Parliament for the extravagances incurred in building Carlton House, London, he rented a modest erstwhile farmhouse facing the Steine, a grassy area of Brighton used as a promenade by visitors. Being remote from the Royal Court in London, the Pavilion was also a discreet location for the Prince to enjoy liaisons with his long-time companion, Maria Fitzherbert. The Prince had wished to marry her, and did so in secrecy, as her Roman Catholic religion ruled out marriage under the Royal Marriages Act 1772. In 1787 the designer of Carlton House, Henry Holland, was employed to enlarge the existing building, which became one wing of the Marine Pavilion, flanking a central rotunda, which contained only three main rooms, a breakfast room, dining room and library, fitted out in Holland’s French-influenced neoclassical style, with decorative paintings by Biagio Rebecca. In 1801–02 the Pavilion was enlarged with a new dining room and conservatory, to designs of Peter Frederick Robinson, in Holland’s office. The Prince also purchased land surrounding the property, on which a grand riding school and stables were built in an Indian style in 1803–08, to designs by William Porden; these dwarfed the Marine Pavilion, in providing stabling for sixty horses. Between 1815 and 1822 the designer John Nash redesigned and greatly extended the Pavilion, and it is the work of Nash which can be seen today. The palace looks rather striking in the middle of Brighton, having a very Indian appearance on the outside. However, the fanciful interior design, primarily by Frederick Crace and the little-known decorative painter Robert Jones, is heavily influenced by both Chinese and Indian fashion (with Mughal and Islamic architectural elements). It is a prime example of the exoticism that was an alternative to more classicising mainstream taste in the Regency style.After the death of George IV in 1830, his successor King William IV also stayed in the Pavilion on his frequent visits to Brighton. Queen Victoria, however, disliked Brighton and the lack of privacy the Pavilion afforded her on her visits there, especially once Brighton became accessible to Londoners by rail in 1841, and the cramped quarters it provided her growing family. She purchased the land for Osborne House in the Isle of Wight, which became the summer home of the royal family. After her last visit to Brighton in 1845, the Government planned to sell the building and grounds. The Brighton Commissioners and the Brighton Vestry successfully petitioned the Government to sell the Pavilion to the town for £53,000 in 1850 under the Brighton Improvement (Purchase of the Royal Pavilion and Grounds) Act 1850. In 1860, the adjacent royal stables were converted to a concert hall now known as the Brighton Dome. The town used the building as assembly rooms. Many of the Pavilion’s original fixtures and fittings were removed on the order of the royal household at the time of the sale, most ending up either in Buckingham Palace or Windsor Castle. Queen Victoria returned to Brighton large quantities of unused fittings in the late 1860s. George V and Queen Mary returned more after the First World War. Since the Second World War, the municipality of Brighton has spent a great deal of time, effort and money restoring the Pavilion to its state at the time of King George IV, encouraged by the permanent loan of over 100 items of furniture from Queen Elizabeth II in the 1950s, and has undertaken an extensive programme of restoring the rooms, reinstating stud walls, and creating replicas of some original fittings and occasionally pieces of furniture.